After 9/11, she compared Osama bin Laden to American patriots in the Revolutionary War. Marcy Kaptur was born in Toledo, Ohio on June 17, 1946. She earned an undergraduate degree in history from the University of Wisconsin in 1968, a master’s degree in urban planning from the University of Michigan in 1974, and a Ph.D. in urban planning from MIT in 1982. From 1969-75 Kaptur worked as an urban planner for Toledo-Lucas County. From 1975-77 she was the Director of Planning for the National Center for Urban Ethnic Affairs. And from 1977-79 she was Assistant Director for Urban Affairs in the Jimmy Carter Administration. After Carter’s electoral defeat in 1980, Kaptur spent a year as Deputy Secretary of the National Consumer Cooperative Bank. In 1982 Kaptur, a Democrat, was elected to represent the Ninth District of Ohio in the U.S. House of Representatives, where she has been re-elected every two years since then. She is a member of the Congressional Progressive Caucus, and her campaigns have been endorsed by the Democratic Socialists of America. In the 1980s, Kaptur steadfastly opposed U.S. assistance to the Contra freedom fighters who were battling the Soviet-backed, Marxist Sandinista dictatorship in Nicaragua. In January 1995, Kaptur sent a letter on official congressional stationery, thanking Holocaust denier Gregg Klemmer for having sent her a copy of a Holocaust-denying documentary video in which David Cole and Franciszek Piper suggested that the Auschwitz concentration camp in Poland was actually built after WWII for propaganda purposes. “Mr. Cole has obviously invested a great deal in researching his subject and I admire his tenacious curiosity,” Kaptur wrote. In 2005 Kaptur became a member of the Out of Iraq Congressional Caucus. In 2007 Kaptur voted against President Bush’s decision to deploy an additional 21,500 American soldiers to Iraq, a deployment that eventually enabled the U.S. to win the Iraq War. In 2009 Kaptur appeared in Michael Moore‘s anti-capitalist film, Capitalism: A Love Story. 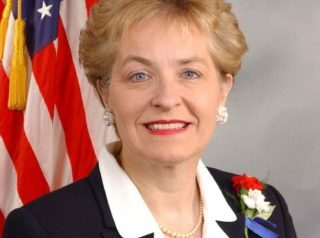 In October 2009, the Socialist Party of America announced in its newsletter that Kaptur was one of 70 Congressional Democrats belonging to its caucus. On January 27, 2010, Kaptur was one of 54 Members of Congress who signed a letter calling on President Barack Obama to use diplomatic pressure to end Israel’s blockade of Gaza—a blockade which had been imposed in order to prevent the importation of weaponry from Iran and Syria. The members, leaders, and PACs of numerous labor unions have been among the leading sources of campaign funding for Kaptur throughout her congressional career. To name just a few of these unions: the AFSCME, the American Association for Justice, the American Federation of Teachers, the International Brothehood of Teamsters, UNITE HERE!, the National Education Association, and the United Food & Commercial Workers International Union. Kaptur today is a member of the NAACP and the National Urban League. For an overview of Kaptur’s voting record on a variety of key issues during her congressional career, click here. For additional information on Kaptur, click here. Further Reading: “Marcy Kaptur” (Votesmart.org, Keywiki.org); “Local Marchers Condemn U.S. Support for Contras” (Toledo Blade, 10-29-1986); “Revealed” Democratic Congresswoman Sent  Letter Praising Holocaust Denier” (Daily Caller, 10-2-2014); “Threat of War Spurs U.S. Soul-Searching” (Toledo Blade, 3-1-2003, re: Kaptur’s comments at the “Preaching & Teaching Peace” workshop); “House Ukraine Caucus Chair [Kaptur]: ‘Some Group Had To Step In To Mediate’” (BuzzfeedNews.com, 3-1-2014); Leading Contributors to Marcy Kaptur’s Political Campaigns (OpenSecrets.org); Marcy Kaptur’s Positions on Key Issues (OnTheIssues.org).